Warfare has long been central to a proper understanding of ancient Greece and Rome, worlds where war was, as the philosopher Heraclitus observed, ‘both king and father of all’. More recently, however, the understanding of Classical antiquity solely in such terms has been challenged; it is recognised that while war was pervasive, and a key concern in the narratives of ancient historians, a concomitant desire for peace was also constant. This volume places peace in the prime position as a panel of scholars stresses the importance of ‘peace’ as a positive concept in the ancient world (and not just the absence of, or necessarily even related to, war), and considers examples of conflict resolution, conciliation, and concession from Homer to Augustine. 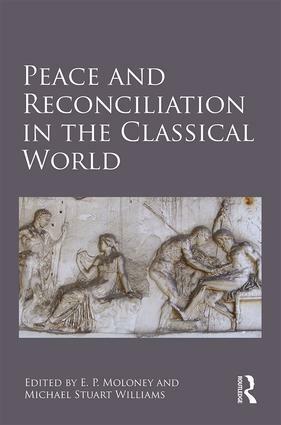 Comparing and contrasting theories and practice across different periods and regions, this collection highlights, first, the open and dynamic nature of peace, and then seeks to review a wide variety of initiatives from across the Classical world. 5 Reconciliation in Later Classical and Post-Classical Greek Cities: a Question of Peace and Peacefulness? E. P. Moloney is Senior Lecturer in Classical Studies at the University of Winchester. Specializing in classical Greek culture and history, with a focus on ancient Macedon, Dr Moloney has published recently on the early history of that kingdom. Building on that work, a monograph on the cultured courts of the Argead kings is now near completion. Michael Stuart Williams is lecturer in the Department of Ancient Classics at Maynooth University. His primary research interest is the intellectual history of Christianity, and he has published on ancient biography and hagiography in his book Authorised Lives in Early Christian Biography (2008). He has also edited two volumes under the title Unclassical Traditions (2010 and 2011). He is currently completing a book entitled The Politics of Heresy in Ambrose of Milan.